Hate is a powerful word, especially when you’re using it against your own reflection. In fourteen-year-old Lacey Steele’s world, being “skinny” equals no more caustic remarks comparing her to Shamu the Whale, meriting the attention of her ten-year crush aka the beautiful quarterback next door, and finally deserving her distant mother’s love — pretty much goddess status. But diets, nor health food, nor exercise bring Lacey desired results and her future looks everlastingly chubby. Unexpectedly, Lacey and her friend Ashley stumble on an easier method. Extreme calorie cutting may seem a little drastic, but of course it’s better than... an eating disorder. Unfortunately, the easy route has a price neither girl planned to pay, but it comes due anyway, for one of them. A story of hope and eventual acceptance, Skinniness is Next to Goddessness? Lacey’s Story, takes a brighter approach to an age old tale. 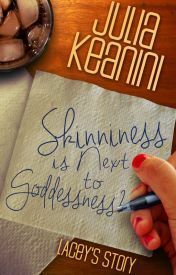 Book One in the Skinniness is Next to Goddessness? Series. I found this to be a really great if slightly underdeveloped read. The character's could have had a little more heft to them but the book really got a message across that needs to be broached with young girls, young people in general. I grew up in a house with a sister with an eating disorder. It was greatly tip toed around and really kind of still is. More books need to be written that are gateways to talking about difficult subjects with one's children. This one is going into the pile to be saved for when my kid's make it to that age.